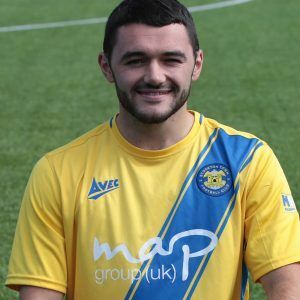 ‘Garbo’ joined us in 2013/14 season from Billingham Town and has been a one of a core of 7 or 8 players who has made a huge contribution to our success in recent years with over 200 appearances. Garbo converted from an attacking midfield player into a right back to help out during 2015/16 season and proved how versatile he was ending up with the Managers and Supporters player of the year awards. Quick with a great touch and a good passer Garbo always makes a contribution to every game especially going forward with plenty of assists and great crosses.